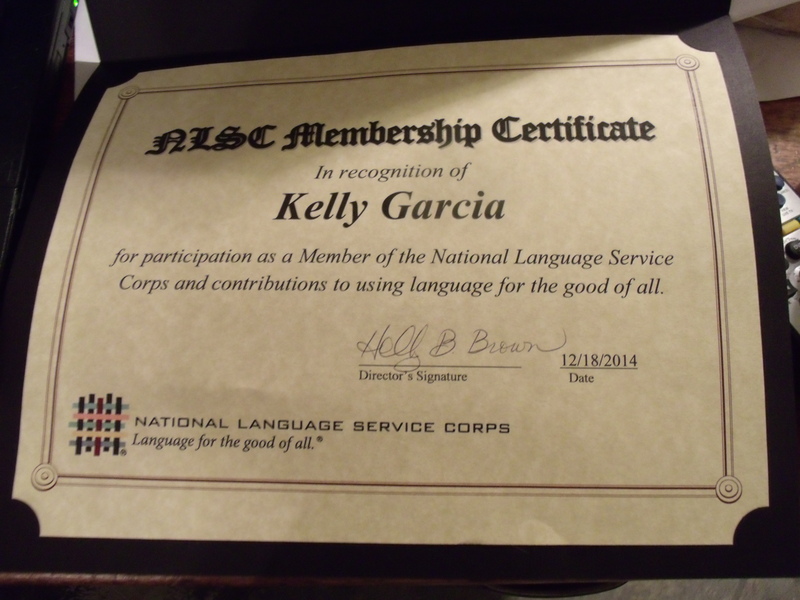 In my quest to do something different, I signed up with the National Language Service Corps. I learned about NLSC at the ACTFL conference in San Antonio in November. The rep knew her business, and I was hooked on the idea of using my language skills in volunteer situations (in or out of the United States). When I got home after the conference, I visited the website and filled out an application. I had to provide detailed information about my language skills, of course, and documentation as requested. Fortunately, I had already taken the OPI exam, so I knew my language competency, and I provided a copy of the results. I think it’s awesome (and smart!) that additional training is provided if an assignment is given. It’s also nice to be able to accept or reject assignments based on work schedules and other things. After all of my information was verified, I was accepted as a member. I love having a certificate to add to my portfolio! If you speak a second (or third) language, please check out the NLSC. You could be a bridge between cultures.